If you love being outdoors and want to build the skills to develop a career in lawn care and landscaping, consider joining the F&W team. 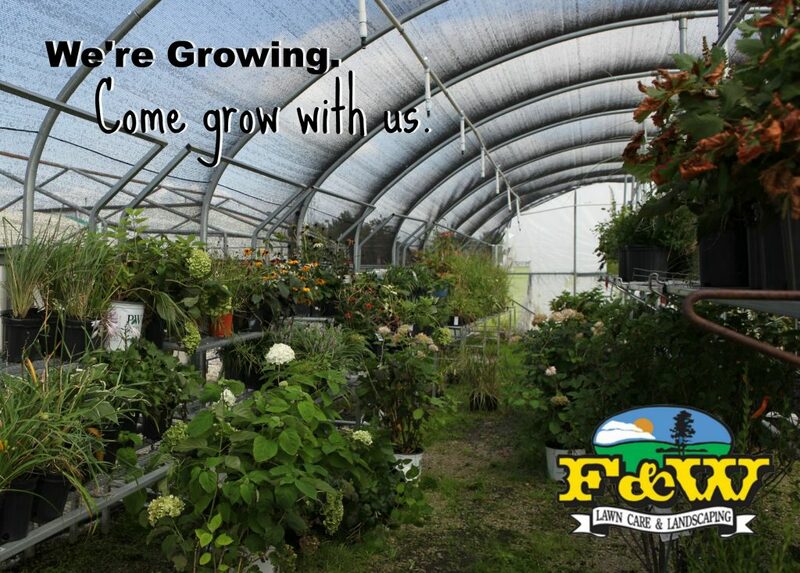 F&W Lawn Care & Landscaping is a family business that has been a premier provider in the green industry for years. We pride ourselves in superb service and high quality work. If you are an energetic person who is hard working and takes pride in a job well done, you could be a great fit! Our team includes a variety of positions such as landscaping foremen and laborers, irrigation specialists, lawn care technicians, snow removal crew members, and office staff. If you’d like to be considered next time we have openings, please fill out our contact form here. F&W Lawn Care & Landscaping has been a premier provider in the green industry for years. We pride ourselves in superb service and high-quality work. If you are an energetic person who is hard working and takes pride in the end result of your day, you will be a great fit to our team! We are looking to hire landscaping foremen. Please apply within or send resume via email. We are looking for Landscaping Foremen with extensive experience in all areas of Landscaping. Please do not apply if you don’t have experience. We offer a sign-on bonus for experienced candidates. If you fit this description, come and join our hard-working team of elite landscapers. manage large landscaping projects and help with the daily operations of our landscaping division. • Have extensive experience in all aspects of landscaping. • Be able to deal professionally and personally with customers and employees. • Position is responsible for the coordination of all resources included but not limited to equipment, vehicles, and labor to insure optimum efficiency. F&W Lawn Care & Landscaping has been a premier provider in the green industry for years. We pride ourselves in superb service and high-quality work. If you fit the requirements above and take pride in the end result of your day, you will be a great fit to our team! Please apply with resume via email. Follow us at @FWLawnCare on Facebook for future opportunities to join our team.